51 Thursday April 22 1875. I walked to school and back today I was terribly tired at night. 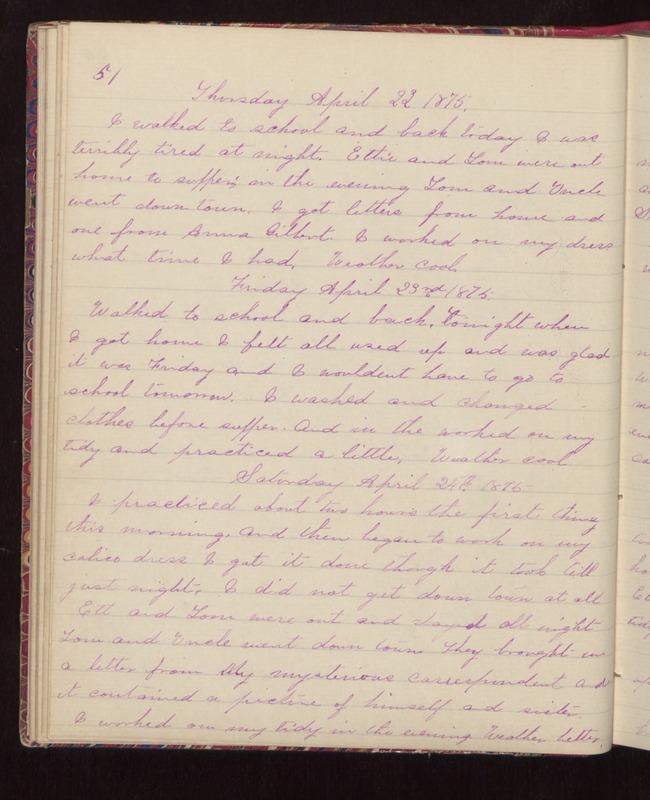 Ettie and Tom were out home to supper in the evening Tom and Uncle went down town. I got letters from home and one from Anna Gilbert. I worked on my dress what time I had. Weather cool. Friday April 23rd 1875. Walked to school and back. Tonight when I got home I felt all used up and was glad it was Friday and I wouldent have to go to school tomorrow. I washed and changed clothes before supper. And in the worked on my tidy and practiced a little. Weather cool Saturday April 24th 1875. I practiced about two hours the first thing this morning. And then began to work on my calico dress I got it done though it took till just night. I did not get down town at all Ett and Tom were out and stayed all night Tom and Uncle went down town. They brought me a letter from My mysterious correspondent and it contained a picture of himself and sister. I worked on my tidy in the evening. Weather better.